After guest starring on Zach Braff’s hit sitcom in 2004, Scrubs, Mandy Moore and the actor began their relationship which would span nearly two years. When the couple broke up, Moore channeled her sadness into her album Wild Hope, and spoke openly about her struggles with depression. In 2013 Zach Braff commented that he doesn’t like dating super famous girls and referred specifically to his failed relationship with Moore. They sure were cute though! The worlds most beautiful couple? Lisa Bonet and Lenny Kravitz might just might have been the world’s most beautiful couple that also produced one of the world’s most beautiful actresses, Zoe Kravtiz. 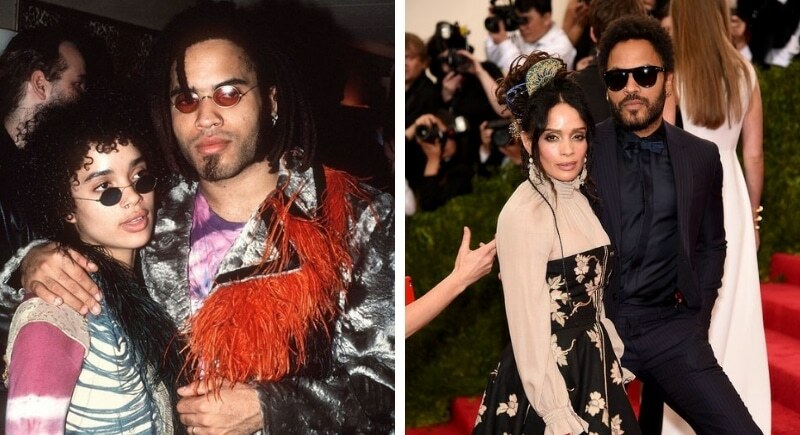 Actress Bonet and musician Kravitz are also seemingly exploding with talent. When Bonet was a mere 20 years old she and Kravtiz eloped in Las Vegas. Bonet has said of their relationship, “When I first told him my mom was Jewish, and he said ‘So’s my dad,’ I thought that was both unusual and enchanting. I felt like, ‘Okay, here’s someone who really knows how it is.’ And I think I trusted him a little more with my feelings and let him inside a little more than I ordinarily would have.” Bonet has since married actor Jason Momoa, with whom she has two kids.